look who dropped by WF Head Temple on his way toward the Front Range the other day! here are a few shots..enjoy and be sure to schedule YOUR unique WF Half-Day Winter Sport Training Camp! Anybody can rent or buy a pair rockered, metal-edged fancy skis, ride a chairlift up a mountain slope and profess to be a skier…however, to know the rasas (essence) of skiing? Got to go to the very root of all skiing; classic nordic skiing on edgeless, skinny skis without a chairlift in sight…ahhhh! Now THAT, my Friend, is genuine skiing! Ohhhhh how ilg loves this shot! Well said. 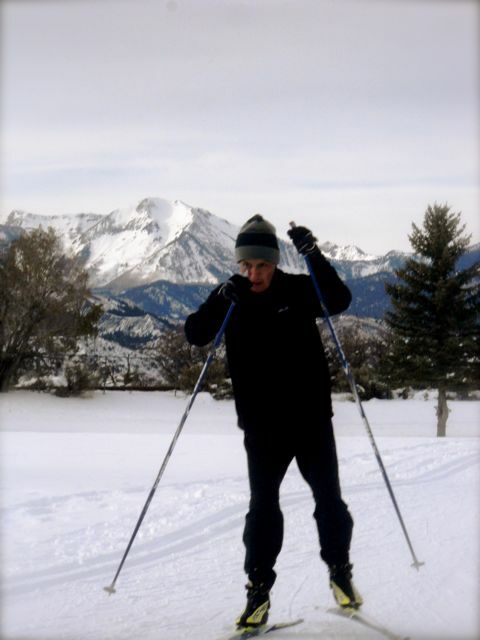 The most enduringly seductive call of nordic skiing to a wholistic athlete is the fact that to c(om)pete well in it? Or even to be effective in it? Your upper body must be as strength endurance strong as your lower body…oh, and not to mention your core has to be the cornerstone of all propulsion. Compare world-class nordic ski racer physiques to world-class marathon runners or Tour de France cyclists….phhhfff! 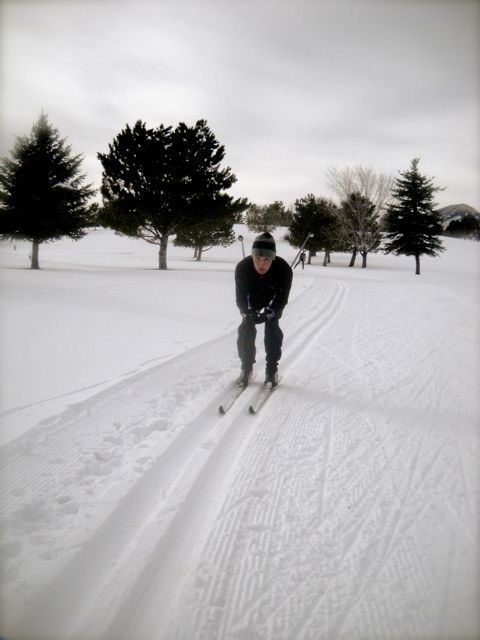 No competition…there is no endurance athlete like a nordic ski racer. Human Performance studies since the sixties have affirmed; nordic ski racing is the most intense endurance sport on the planet. After our classic clinic/workout, we made a final transition into our nordic skate skiing gear…the above pic details Warrior Leaf’s fantastic focus on the V-1 Technique whereupon the inner affirmation is, “Step, Glide….Step, Glide…Step Glide…” I describe V-1 Technique as the “bread-and-butter” of all nordic skate skiing. It’s used on everything from false flats to all uphills. 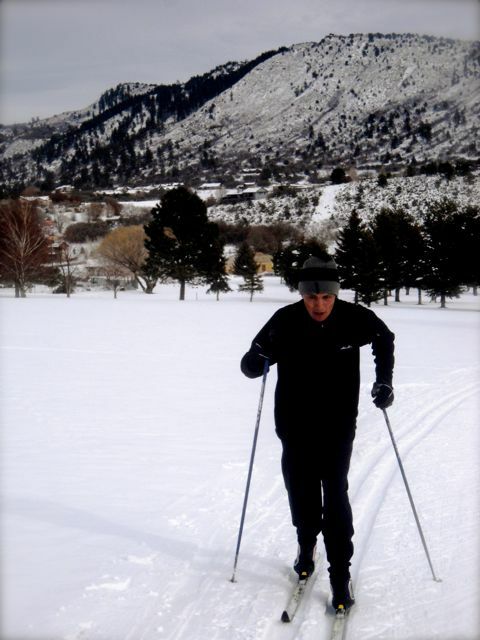 Working with Warrior Leaf in skate skiing is made so much more easier from a coaching standpoint due to the fact that he has been a devoted HP Yoga® student of mine for several years…so, if i sense too much kyphosis (rounded) in his spine, the simple voice c(om)mand of, “Bring more Upward Dog!” totally revitalizes his spine, lifting his sternum away from sinking into his pelvis. If, as another example, my coaching call to him is, “Feel Mula Bandha!” he knows by kinesthetic training conditioning, to engage his pelvic floor, scrape his tail under, and press his abs spineward. S(om)etime, in the future, perhaps after feeble ilg is long gone, the fitness warrior tribe will finally embrace the East/West Wisdom upon which WF now and for the past 35 years, has been forwarding sooooo far out in front of the other methods…. on this MahaYogi JC’s birth eve!